Sandy has left us in the dark. We expected it- we live in a fairly rural corner of Bucks County, PA, where there are overhead power lines and a lot of roads lined with trees. Fifty-plus mile-per-hour winds don’t mix we’ll with that combination. 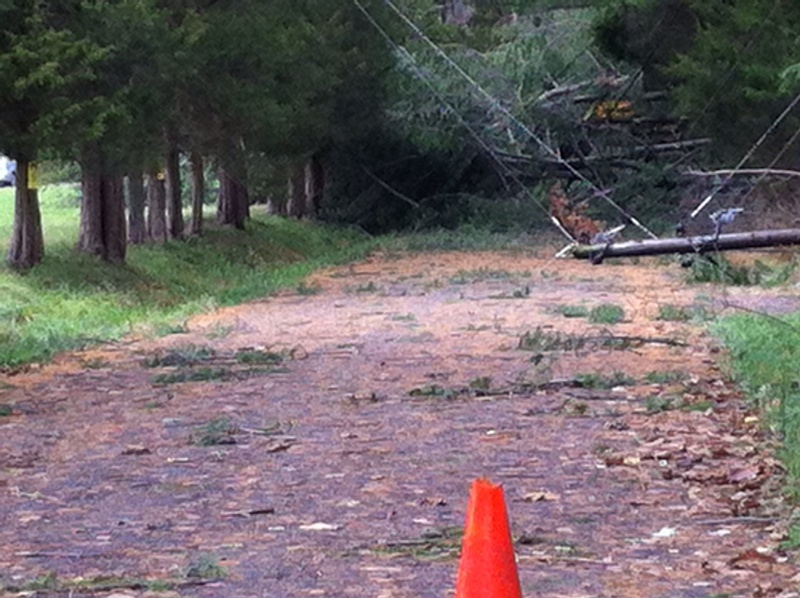 The October ice storm left us without power for 4 days last year – the longest power outage I’ve ever experienced. 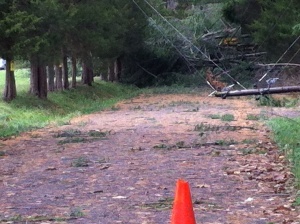 There were at least four breaks in that line – the power company called me every time they thought my power was restored. We are pretty far down the line in the count of homes restored when a break is fixed, so we are not where the crews would be sent first. So we have settled into our emergency routine without a fuss. It was about 5:30, so just after sunset when the lights went out for the last time. We had a number of flickering warnings, so we had lit the paraffin hurricane lamps and candles, and built a fire. We had gotten a new load of firewood earlier in the day – we ordered it a week ago but were both away on business and the scheduled delivery hadn’t arrived. It was pouring rain and already windy then, but we brought in plenty and stacked it in the back hall to dry. We filled the collapsible camp bottles with water to add to the stash I keep in the cellar for just these occasions. The schoolhouse is really quite beautiful by candlelight – I posted a picture on Facebook. I never post my life events, but it seemed fitting. Lots of friends world-wide would wonder what it was like in the storm. After that we settled in, knowing there wasn’t much choice. The wind was the fiercest I can remember – branches banging on the windows that belied the mellow shrubs that were there – I went outside to take down a four ounce hummingbird feeder that hangs on the picture window in my office – it was banging so hard I was sure it or the window would break. We played Scrabble and whiled away the evening. Even with a dozen large jarred candles and 5 paraffin lamps, the room is surprisingly dark. I would have to strain to read by such light. I thought about all the people who lived this way every night of their lives until century ago, and all those that still do. I wonder how much electric light has advanced literacy. We woke up and did what chores we needed to do, and then I began to feel restless, and the thought of powerlessness struck me. I couldn’t get on-line – not only was the power down, but apparently so were the local cell towers. Once in a while I could get one bar and receive a text message from someone worrying about us. Our only contact with the outside world was the radio – the little NOAA unit I got my husband for Christmas worked very well – it gets better reception than any other radio we own. It has a good old-fashioned extendable antenna. It also has a solar panel and windup generator, which is kind of cool, even though we have plenty of batteries. But what do I do now? No email, no internet; I can’t do laundry or watch TV. I contemplated the message from the universe – you are powerless. Interesting, I thought. So what does it mean to have power, and what does it mean to be without it? On the Enneagram, I am an Eight, which is the point that is all about power. Average Eights are typically bossy and autocratic – they are insensitive to the feelings of others and used to getting their way. Healthy Eights are generous and care-taking with their power, but powerful nonetheless. Their virtue is innocence, but it is a hard sell – innocence is so vulnerable – if I allow myself to be innocent I am likely to be a dupe. Eights are particularly sensitive to being conned. After a while, though, the novelty wears off. Food spoils in the refrigerator. It’s cold. The boss expects you at work, even if you have no water to take a shower. We must decide whether to wake up in the night to stoke the fire and refuel the generator, or sleep through and wake to a cold, dark house in the morning. People ask about you – are you okay? Is it dramatic or not? Life isn’t normal, even as the new routines form to carry flashlights and cook without an oven or microwave. Then there is the realization that while this is a temporary inconvenience with a few minor losses, for some this is a truly life changing event – the loss of a home or a life – the world will never be the same again. Sobering. Real gratitude surfaces – I am okay. My family are okay. My friends are okay. We can recover. We have resources, support, caring, love. People reach out. Companies extend due dates on bills, neighbors help move big branches, people are patient and polite even as they wait and wait to get gasoline or water. We survived, we will survive. Priorities are re-evaluated. I am struck by presence – and mindfulness. Mindlessly flicking on the light switch as I enter a room reminds me of the here and now – I am powerless. People are late because they have to take detours – it is manageable. The stores don’t have all the things I want – we are so interdependent – all those people I hardly notice every day, making deliveries, doing their work – I notice their absence. I feel almost as though my world is suspended, and yet it continues anyway. So what do I need power for, anyway? At its basest level, we want power because it will make us happy. If I can influence my world to do what I want it to do, I will be happy. I can make the dark light, I can get other people to do what I want them to do, I can get my needs met. And yet I am reminded that that particular string of causes and effects is not true – I can be happy when my needs are not met as I wanted them to be, and I can be unhappy even when my needs are met – if I choose to be. Happiness has much more to do with my mood and perspective than the situation I am in, and the power to shift my mood or perspective is always within me, whether I choose to use it or not. There are things I really am powerless over. People I love will die – I will, too. People will believe what they believe, even if I think the facts and values say those beliefs are not true. There will be big storms sometimes that will destroy property and knock out the lights. My heart will be broken because I dare to let it be vulnerable. I will be duped. But for today, at least, I have the power to choose my thoughts, my perspectives and whether to be happy. The lights came back on after a week. I could see all the changes we made to accommodate the darkness – extension cords to run the necessities with the generators, flashlights and candles everywhere, baskets of laundry – there’s much to do to restore order. The refrigerator died and has to be replaced. There’s a tree down in the yard. As relieved as I am to be able to turn on the news, to feel heat in rooms that don’t have a fireplace, and get my work done, I am a bit sad to know I will have to work harder again to be mindful, to create my own reminders for being present and grateful. It’s ok – I can do that work, too. I am never really powerless.